Much loved wife of Aubrey, loving mother of Pamela and Cherie, dear mother in law of Jordan and Neil, devoted grandmother of Lisa and Jack. 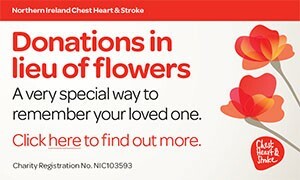 Family flowers only please, donations if desired and cheques payable to Christ Church Building Fund c/o Brown's Funeral Directors, 25 Church Street, Limavady. I am sorry to tell you that Grace Margaret Frances (Ivy) Hamilton has passed away.